No organization exists in a vacuum. For that reason, it’s important to know what your peers say and how they say it. Unfortunately, a lot of companies turn a blind eye to competitors. As part of our series on research and why it’s important, we’re discussing the importance of checking out the competition during your research phase. At WCM, competitive analysis is a key component of our communications strategy. This exercise identifies your competitors, shared audiences, and perception in the marketplace. Scoping out the competition is an essential step when developing a communications strategy. By assessing the current landscape, you’re able to determine what does and doesn’t work in your industry’s environment. Is there a certain way your peers use social media that makes them more prolific? Do they use e-newsletters to drive traffic back to their websites? Are they using video to keep their users engaged on all platforms? These are some of the key questions we ask when looking at our clients’ competition. 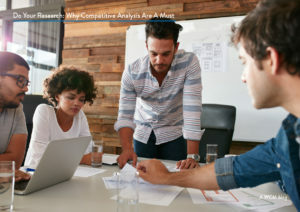 Competitive analysis can start out easily. Take some time to look at your competitors’ websites, read their brochures and newsletters, and conduct some social listening. Social listening is the process of tracking conversations around specific phrases, words or brands, and then leveraging them to discover opportunities or create content for those audiences. These initial first steps provide a good overview of how your peers talk about themselves. How does their own chatter compare to what their consumers say about them? Use digital tools like socialmention and Topsy to sift through blogs and social platforms and determine the best ways to engage with your audience and see what people are talking about. Tools such as these help identify what your competitors are doing right (and wrong) in the eyes of the most important player – the user. The competition might be tough, but it’s worth it to watch. Learning from their successes and mistakes will help your company or organization design tactics that distinguish your brand from theirs.